Understanding and preserving glass evidence can make your case stick! Thanks to Robert Gundacker, Yavapai County (Arizona) Public Defender for the inspiration to write this article. Sadly, these types of headlines can be seen regularly in the news. Closer to home for me, because of my experience with glass, clients in each of those situations used my investigation and expert witness services to help uncover the mysteries about what really happened on those horrible, fateful days. 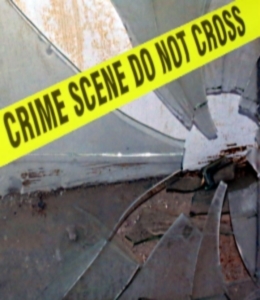 Each year thousands of crimes and accidents involve broken glass. Glass is a favorite way for perpetrators to forcibly enter a building. Dangerous and often fatal accidents occur when people fall through glass or when glass falls on them. In my experience with such a occurrences it seems that law enforcement professionals sometimes overlook the glass evidence tomaximum advantage. There appears to be an absence of standardized protocols for police detectives and accident investigators to work with evidence glass fragments. With a better understanding of the information contained in glass evidence and better procedures for how to preserve this evidence, law enforcement and accident experts can be far more effective in performing their work. And so here is my contribution to the development of investigation standards for crimes and accidents that involve glass evidence. I hope this article will elicit discussions that will lead to better and more uniform protocols for understanding and preserving glass that is evidence in crimes and accidents. I also recognize that many good people have already published excellent information on this subject. I will reference these at the end of this article. When glass breaks you will see cracks going in many directions. If you look closely though, you can see primary cracks and these point to the origin of the break. When the middle of the glass is missing you can still look for primary cracks in the glass fragments that remains in the opening. Often there is enough glass remaining in the frame that you can identify the approximate origin location. I have even drawn lines on photographs of glass evidence to locate the origin by finding their intersection. When a force is applied to glass so much that the glass breaks, the cracks follow a path that most efficiently dissipates the force. Structural engineers call this path the “load path”. Primary load paths travel from the point of force or impact to the edge of the glass. Often these cracks form triangular shards in the glass. Once the crack runs to the edge, much energy is released. 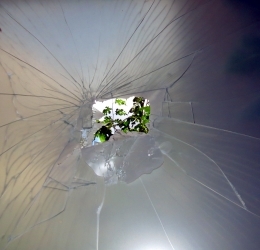 If the force or impact continues, such as a body continuing to pass through the glass, there will be an additional need for the glass to break as it dissipates yet more energy. Secondary cracks can form which subdivide the large triangular shards into smaller pieces. These cracks are often circular. They form in concentric circles around the impact. 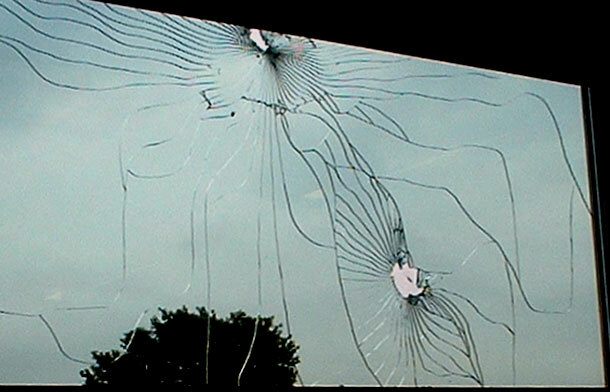 Things can get complicated when the glass is impacted more than once. Consider what happens when a person falls through glass. The first impact is often the upper body. Shoulders tend to be wider than other parts of the body and might hit first. Elbows and arms can easily arrive at the glass first. There are situations where the victim’s hip or buttock hits and breaks the glass. If the person continues through the glass, they might then trip over, or fall down onto a window sill or frame, causing their motion to go downward or pivot out and around that tripping point. Having a leg or foot fall down on top of the lower part of the glass constitutes a secondary impact which will have its own load paths and fracture lines. In this example it is easy to see that there were two points of impact. Other times it is not so easy. But here's a challenge for budding glass evidence detectives. Which impact occurred first? Read this article carefully, make your best guess and find the answer at the end of the article. Good luck!! If you think of cracks in glass as releases of energy, then it is not hard to understand that more energy will require more cracks to release it. Glass fractographers refer to this phenomenon as the glass “creates more surface” across which to dissipate energy. Large shards and meandering cracks show that the energy applied to the glass was low. If the glass is obliterated into thousands of pieces you can assume there was quite a bit of energy being released in the glass. The descriptions of glass breakage presented above can best be observed in annealed glass which is, by definition, relatively devoid of internal stresses. Tempered glass, on the other hand is the best example of glass that has a very high amount of energy already inside it. The tempering process purposely creates permanent tension/compression within the glass for purposes of strength and safety. When breakage does occur, this high level of energy is released, creating very many small cubes of broken glass. Even though this energy released takes a fraction of an eye blink to fully consumes a piece of glass, the careful observer can see primary cracks in broken tempered glass. The best way to see primary cracks in tempered glass evidence is when the tempered glass is also laminated to another piece of glass so the pieces remain in place after breakage. Would your police department like a one-day seminar on understanding and preserving glass evidence? Call now to schedule. The workmen already installed clip anchors at the sill, so the rafter assembly can be readily bolted to it after it is lowered in place.